Property was clean and staff polite. Restaurant food was amazing. Easy access to slopes and lockers to store ski gear. Friendly and the swim facilities. Good quick service to sort out some non-functioning parts in the room. Everybody was very friendly. Access and proximity to the slopes - being able to ski in and out, is very good. Problem with the shower was solved very quickly and efficiently. The staff were very friendly and helpful. The location for skiing is good. Swimming pool is good. The free bus to the village is very good. Very good facilities. Convenient access to the pistes. Excellent restaurant on site. Apartments very comfortable and well equipped. Staff helpful and very polite. Lock in a great price for Résidence Pierre & Vacances Premium Les Terrasses d'Eos – rated 8.5 by recent guests! 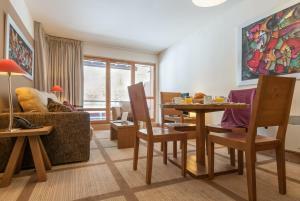 One of our top picks in Flaine.This residence offers apartments spread over 2 buildings. 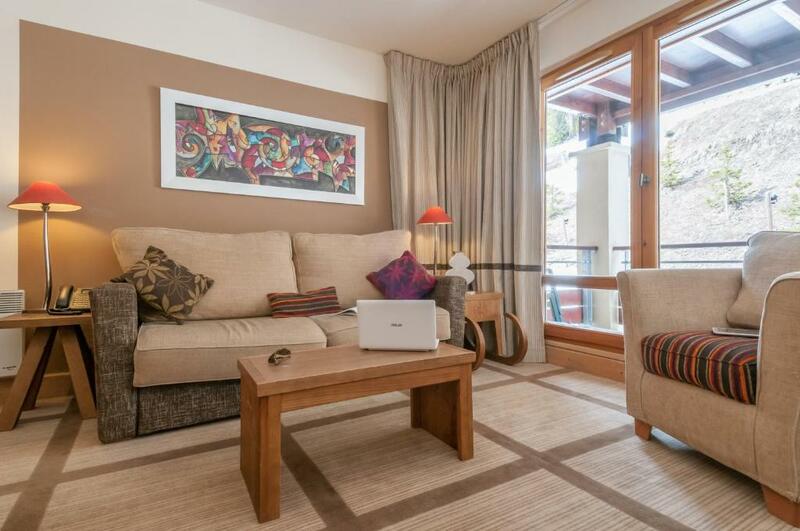 Résidence Pierre & Vacances Premium Les Terrasses d'Eos is located only 1,650 feet from shops and restaurants of Flaine Forest. It features an outdoor heated swimming pool. The uniquely designed apartments feature a well-equipped kitchenette, satellite TV and free WiFi internet access. Admire the view from your own balcony or terrace, or from the large bay windows that welcome the sunlight and overlook the magnificent surrounding landscape. Guests can enjoy customized massages, facial treatments and exfoliation treatments at the Deep Nature Spa, for an extra fee. During winter, there is a shopping delivery service available at an additional cost and the bread and pastry delivery service allows you to order your in–room breakfast the night before. A breakfast by Fauchon is also available for a supplement. After lunch, guests can enjoy board games, books and borrow a portable PlayStation. Upon prior reservation and depending on the date of the stay, guests can benefit from reduced rates for ski passes and equipment rental. Enjoy direct access to the Flaine and Grand Massif slopes as it is a ski in/out residence. Other facilities include a hot tub, a Turkish bath and a fitness area. Résidence Pierre & Vacances Premium Les Terrasses d'Eos has a 24-hour reception and unsupervised baggage storage. Charging stations for electric cars are available at this property. 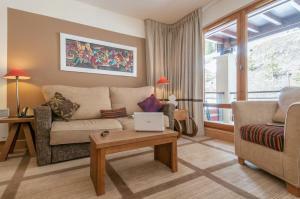 This property is also rated for the best value in Flaine! Guests are getting more for their money when compared to other properties in this city. When would you like to stay at Résidence Pierre & Vacances Premium Les Terrasses d'Eos? 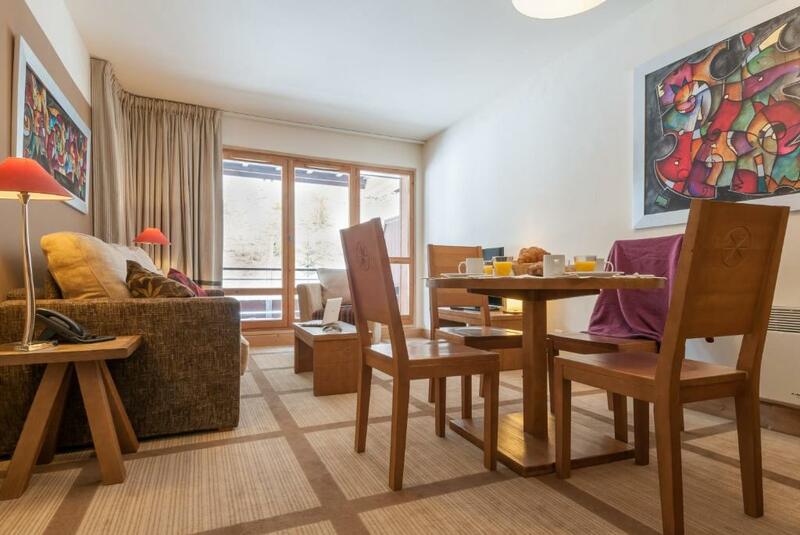 This apartment features a living area with 1 double sofa bed and one bedroom with a double bed or 2 single beds. Beds are made prior to arrival. It has one independent bathroom with a bath or a shower. The fully equipped kitchenette opens on the living area. This apartment features a living area with a double sofa bed, one bedroom with a double bed and one bedroom with 2 single beds or 2 bedrooms with a double bed. Beds are made prior to arrival. It has one independent bathroom with a bath and a shower. The fully equipped kitchenette opens on the living area. 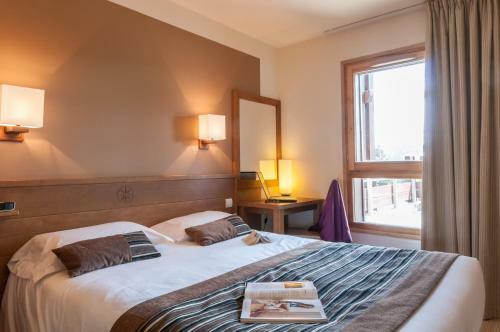 This large apartment features a living area with a double sofa bed, 3 bedrooms with a double bed or 2 bedrooms with a double bed and one bedroom with 2 single beds. Beds are made prior to arrival. It has 2 bathrooms one of which has a bath and the other has a shower. The fully equipped kitchenette opens on the living area and has a Nespresso® coffee machine. 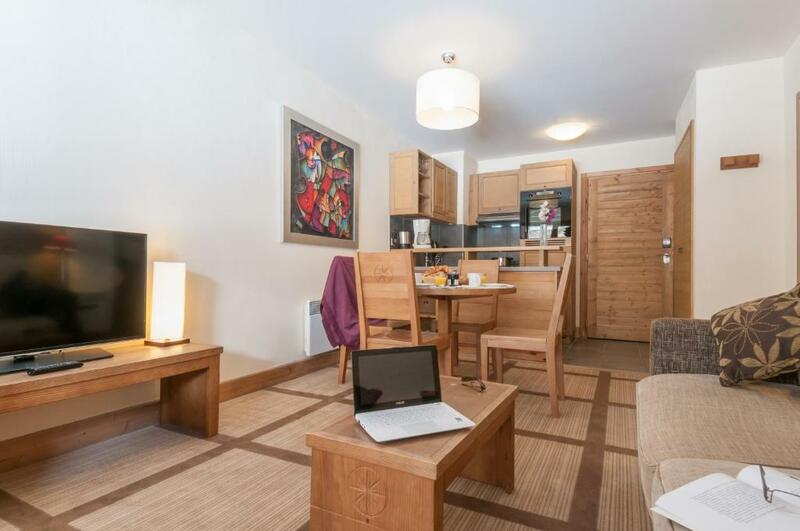 This apartment features a living area with a double sofa bed, one bedroom with a double bed and one bedroom with 2 single beds or 2 bedrooms with a double bed. Beds are made prior to arrival. It has one independent bathroom with a bath and a shower. The fully equipped kitchenette opens on the living area and has a Nespresso® coffee machine. House Rules Résidence Pierre & Vacances Premium Les Terrasses d'Eos takes special requests – add in the next step! Résidence Pierre &amp; Vacances Premium Les Terrasses d&#39;Eos accepts these cards and reserves the right to temporarily hold an amount prior to arrival. Résidence Pierre & Vacances Premium Les Terrasses d'Eos accepts these cards and reserves the right to temporarily hold an amount prior to arrival. Please note that reception opening hours are subject to change, please contact the residence before your arrival. Contact details can be found on the booking confirmation. Price includes: Bed linen, towels, household linen, a cleaning kit, 2 bathrobes, end-of-stay cleaning (except dishes and kitchen corner), Hammam and/or Sauna. For stays of more than 7 nights during Winter season, mid-stay cleaning (excluding the kitchen) is included. A baby kit, suitable for children under 2 years weighing less than 15 kg, is available free of charge. The kit includes: 1 cot, 1 high chair, 1 changing mat and 1 pushchair. Subject to availability and prior reservation. In case the total amount of the reservation is not paid in the time-frame set in the policies, the property reserves the right to cancel the reservation and apply cancellation fees. Please note that for stays of a week or more, guests can benefit from the Loisipass (only available in summer) which includes activities such as hiking, and a 45-minute golf session for beginners. Activities are subject to availability. Food limited for those with allergies and intolerances. Limited times for serving good throughout the resort. Very difficult to get fed! The steak at the hotel restaurant was amazing though, I’m sure the food is lovely for those who can eat it. It’s frustrating for people with real allergies when places cater for vegetarians, but not coeliacs who can actually become very ill if they eat something they shouldn’t. Great location, straight onto the slopes! The ventilation system was too noisy. The information about the hotel was too little when we checked in. The location, close to the pistes. Swimming pool. The temperature of the showers were temperamental, either too hot or cold. Good location and ski in ski out is perfect. Downstairs restaurant could have been more convenient. The pull out sofa-bed is quite unfomfortable. Some fixtures and fittings are a bit broken or dated. Bread wasn't very fresh compared with the spa next to Helios. No longer running taxi service to The Forum, only To Foret. When the three of us arrived in our room there was a very bad smell!! The windows had been left open by house keeping so they obviously knew it was there and chose to do nothing else about it. This should have been reported to maintenance and repaired before we arrived! We were in a two bedroom apartment ( for six) which had the second bedroom/EnSuite blocked off. The smell was definitely coming from there and was so bad I thought there was a previous gest which had passed away and been locked in the room! As it was quite late we had to put up with it for the first night, and reported it first thing in the morning. House keeping came in and sprayed some air freshener, and said that maintenance would look into it. After returning from the slopes we found the smell to be still there and had another trip to the reception. I asked for a room move but was told they were fully booked. However the maintenance guy came and opened the blocked off bedroom up. He found no body! but discovered a fault in the air recycling system, which was blowing the smelly air in rather than extracting it. The ski locker room had no heating in it and after two days skiing our boots were damp and we had to take our boots back to our room to dry. The room had too much furniture in it so much so that the table and chairs could not be used, don't know how six would manage. Some of the kitchen equipment was not clean and some was missing. The sofa was uncomfortable. And there was little cupboard space for our clothes. This is the third time in five years we have stayed here and feel the standard has slipped! Check in at 5 pm. Apart from that, everything was in good order and functional. Microwave needs to be standard fitting in kitchen. Good ski in ski out location for competent skiiers. Not so good for adult ski school who would need to take ski bus to school. Good restaurant but not really child friendly. Facilities generally good but no microwave in apartment. Shoul be a standard fitting. Generally a good experience. Out of hours mini bus service to Flaine Foret good.